Parenting a child with ADHD can present it's challenging moments. Perhaps as a parent, you are feeling frustrated, overwhelmed or confused about what to do next to support your child. Maybe you feel isolated trying to manage their needs and challenges. Maybe as the parent you also have ADHD which makes it hard to be consistent and stay on top of their needs for support. ADHD can impact the whole family and create stress with relationships and communication amongst siblings, parents, extended family and even friends. Perhaps you have a child who could use their own 1:1 coaching support toget unstuck, feel better about who they are and learn how to leverage their strengths and identify their best strategies as they are wired to succeed. As ADHD Coaches, we understand what you are going through. ADHD Coaching can help you or your child move past troublesome experiences to create more harmony and joy on the home-front and more resilience and connection in your family life. They can help to bridge the gaps with executive function skills, life skills and ADHD friendly strategies that leads to better days. 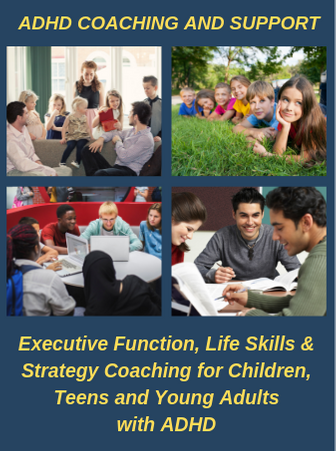 Tweens, Teens and Adolescents can benefit from their own ADHD Coach! Trying to help tweens, teens and adolescents with school or in other areas of thier life can sometimes be easy and other times extremely difficult and frustrating. During this stage in life they desire more independence and being able to make their own choices and decisions. They may naturally have the urge to push back or get frustrated with parents who are trying to help. This in turn adds more tension and stress in the home and your family relationships. Working directly with a coach can help alleviate some of the tension and stress in the parent-child-family dynamic and help the child take ownership with understanding their ADHD, establishing and owning their goals and actions, and experience more success with important school, social or life skills. Individual Coaching Packages are available for Parents and Youth. The first step if you are interested in individual coaching is to visit our Meet Our Team page and use the link to schedule a complimentary get acquainted session with the coach of your choice. During this time, you will have the opportunity to get acquainted, ask questions, learn about the different coaching options that might help and determine if coaching is a good fit for you. More Success, Less Struggle Parenting Workshop: It's believed that an important way to help ADHD children succeed is to give them opportunities to build on weak executive function skills. This is true, but not the whole story. This workshop takes a holistic approach to helping children with ADHD to strengthen executive function skill deficits while integrating other key approaches to achieve sustaining long-lasting results. Click here to learn more and sign up for the program. Please sign up below to stay on our list, so we can send you some occasional emails with free resources, helpful tips and updates about future programs to support you.